I hear that we've arranged a friendly in Dingwall against the tinks, £5, money to go to Magies Highland. Wednesday night, 7pm kick off. Great news, we get to see County smash Caley and all for charity too!! Sadly will not be going, have football training. DRAPER AND MCKAY TO SCORE - NOW THAT WOULD BE SWEET!!! I am interested to see what like a team we put out. You would think with it being an International weekend coming up he would field his strongest; however, some lads will be carrying injuries that we can rest and I bet he would like to see more from the lads that moved up to the 1st team squad from last years winning Dev squad. I would like to see those lads used but I also want our 1st team to be on display tonight and hopefully run riot. Would imagine there is a possibility of the likes of Davies, Gardyne, O' Brien, Curran all who have featured heavily in recent weeks or have had injuries largely sitting this match out and the "fringe" squad players getting a run out- such as Chow, McKay , Dow Tumilty. Yes, I'm happy to see some fringe players play tonight and for a £5 entry fee I don't think anyone can complain if they do. I just really hope we are not looking to play a lot of Dev squad which I don't think we will seeing they only played yesterday. No disrespect to them but there are boys like the ones you mentioned but also the Dingwall brothers, Greg Morrison, Dylan Dykes & Blair Malcolm who have stepped up to the 1st team. I think we might see the bench from Sat start and these lads step onto the bench. On the other hand I go back to my selfish plan of putting out the big boys, running riot for an hour then make changes but it will not be like that. Either way I am looking forward to the game and an opportunity to get another one over our lower league neighbours but most importantly it is a great thing to do for a fantastic cause. Chow has been called up for international duty so probably won't feature, will be interesting to see what kind of team he puts out, personally , I wouldn't be keen on risking too many first team regulars in a friendly against a bunch of dirty cloggers, unless Coyle is unaware of their reputation. Still going to go anyway, it's for a good cause. 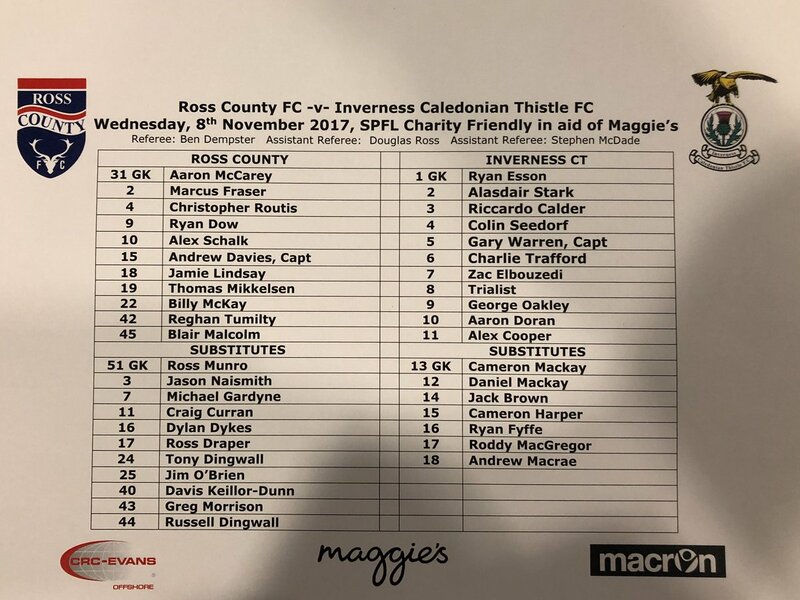 Saying in the papers "I will involve a number of lads who started on Saturday and some, like Billy McKay, Alex Schalk and Thomas Mikkelsen, who were on the bench"
The other thing is who do Caley put out? They have a big game on Sat v Falkirk in the Q Final. Looking forward to another midweek glory night under the lights. Who's in our/their starting XI? (11-08-2017, 08:35 PM)frankthetank Wrote: Who's in our/their starting XI? Is that not Caley's best XI pretty much? Strange they're going all out in a midweek friendly, even if it is a derby. Thanks for putting that up Stuart. Schalk, McKay & Mikkelsen, does that leave the midfield a bit weak? Looks to be entertaining. Watching the updates on Twitter and seems to have been a few chances. McKay has to score though, if he is still on. First team for Caley, maybe shows how much they and Robbo like us?